A group project with Mick Geerits, Duncan Carter and Eirini Maliaraki. The ‘Augmented Nature’ project was carried out in close collaboration with scientists to develop the next generation of high-tech biotags that can augment the capacities of endangered species. These active solutions enable so-called Ecosystem Engineer species namely the Humpback whale and the Peccary to reclaim and change their own habitats. Both experimental interventions shed a new light on how we interact with other species. These are the first step towards a future where instead of mitigating our impact on nature, we aim for a positive impact. Augmented Nature is a set of robotic tools that help animals adapt to the mass extinction. The tools enhance the capacities of so called Ecosystem Engineer species to reclaim and change their own habitats. 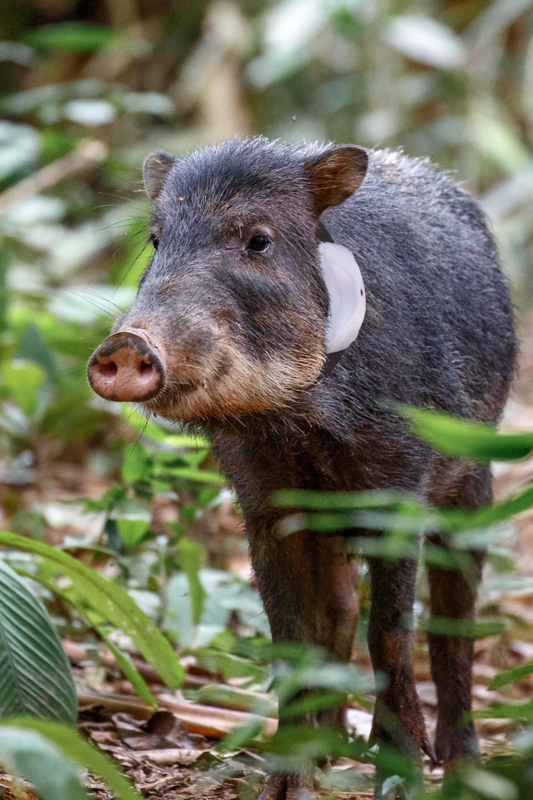 Our new biotag supports the ecosystem engineering capacities of the peccaries and enables them to rebuild their habitats. It uses vibrations to convey information about the forest and guides peccaries towards deforested areas where they can disperse seeds. The tag also has the capacity to locate valuable new resources in the forest, i.e fruit, herbs that are useful to the local communities and can provide new income sources as an alternative to logging.